The highly-anticipated Battlefield 3 is finally available in North America and is set to roll out around the globe in the next few days. If you have pre-ordered before hand, you should be getting your copy really soon. However, after watching the video below, you might not be as excited as before. Well, a full-fledge simulator as featured on The Gadget Show have been specifically crafted for First-Person-Shooters and this one-of-a-kind thing will make you want it so damn badly. 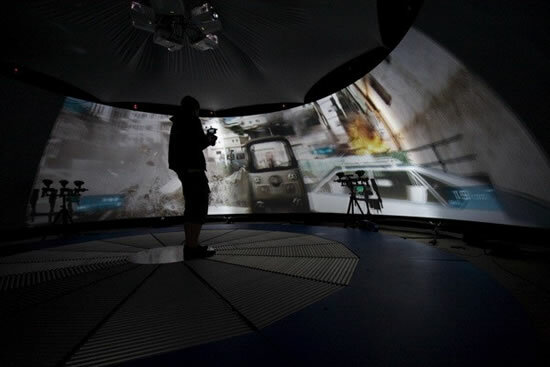 Trust me, spending up to $650,000 on an entire studio, flanked with paintball guns, motion-tracking sensors and a 360-degree screen, the ultimate gaming paradise will indisputably replace your desires for Xbox 360s, PS3s and even Kinects. It blurs the line between virtual and real-life gaming and by completely immersing the players, it creates the ultimate experience. In fact, I was thinking this might be the future of next-gen consoles.